Albums by Peruvian Artists Cosa Nuestra and Bareto nominated for 17th annual Latin GRAMMY Awards Airing this Thursday from Las Vegas. Cosa Nuestra nominated for Best Tropical Fusion album for "Pregoneros de la Calle" and Bareto's "Impredicible" nominated for Best Recording Package. At this year’s 17th Annual Latin GRAMMY Awards, Peruvian group Cosa Nuestra is nominated for Best Tropical Fusion album for its “Pregoneros de la Calle,” and the most popular alternative band in Peru Bareto’s album “Impredecible” is nominated for Best Recording Package. 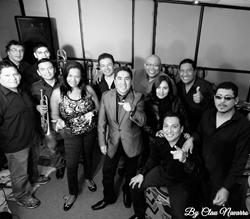 Fusing Peruvian creole, afro-Peruvian music, salsa, merengue and more, “Pregoneros de la Calle” is one of Cosa Nuestra’s greatest accomplishments. In addition to the amazing honor of being nominated for a Latin GRAMMY Award, the group also performed at the 56th Annual International Festival of Vina del Mar. Released in November 2015, “Impredecible” has given Bareto a broader international reach. With the enduring influence of Peruvian Psychedlic Cumbia, the group ventured out to include everything from instrumental cumbia and electronic elements to deep dub atmosphere. The group has completed successful tours in Peru, the U.S., Japan and Europe. The art director on the Latin GRAMMY-nominated “Impredecible” is Goster. The 17th Annual Latin GRAMMY Awards air live from Las Vegas, NV, on the Univision network, November 17, 2016. The Category for Best Tropical Fusion Album is for vocal or instrumental albums containing at least 51% playing time of newly recorded material based on classic tropical rhythms as Salsa, Merengue, Vallenato, Cumbia, and Bachata, mixed with cutting edge (or avant-garde) sounds as Electronic, Rock, and Pop. For solo artists, duos, or groups. The Category for Best Recording Package is for graphic design, quality and concept recording packages, in any configuration, released for the first time during the Eligibility Year; even if contents were previously released and providing the packaging is new. Only original artwork is eligible. Also eligible are digital recording packages providing proper credits and supporting material are received. Award to the Art Director(s). For more information for Bareto, visit http://www.bareto.net.